Operating in a seasonal industry can mean a fluctuating cash flow depending on the time of year. One month may see record profits, while another month may have minimal to no transactions. 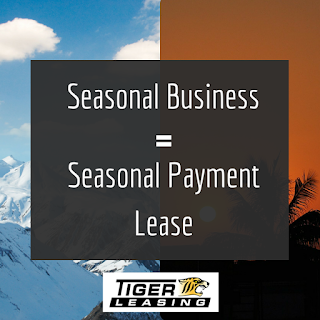 Although this inconsistent sales model can be daunting, there are seasonal payment leasing programs that can help ease off-season expenses. In order to meet these challenges, it’s important to keep in mind certain elements when investing in a seasonal lease. In order to create a solid seasonal payment plan that will fit your business’s needs, it’s important to go over the specifics of your revenue, expenses and timeline. For example, a company selling summer recreation equipment in a more temperate climate like New Jersey will be able to pay high lease payments during late spring and summer months, but not in fall or winter. As the temperatures cool and profits dry up, lease payments will be adjusted to reflect the company’s dramatically different earnings. Having extensive knowledge of your company’s expected financial shift from season to season will make planning an affordable lease payment plan much easier. Identify marketing opportunities. Bolster your social media presence, connect with other local businesses and follow your target audience. Brainstorm ways to keep your marketing strategy strong. Check out the competition. Do extensive research of your competitors to get insight on what is and isn’t working for them, or what they’re planning on doing for the next season. Knowing their moves ahead of time will give you an edge. If you’re considering a seasonal payment lease to help with routine costs, you may also want to consider expansion options. Investing in new technology or equipment for a complementary seasonal business during your off-season could be a way to jump-start more consistent and sustainable profits. For example, a summer recreation equipment rental business may consider a lease to invest in winter recreation equipment. Regardless of your industry, seasonal payment leasing programs are adjustable to fit your specific cash flow. This allows you the flexibility to acquire the equipment you need without worrying about off-season dips in profits. Learn more about Tiger Leasing leasing programs and contact us today. Is a Lease or a Loan right for you?